The Deming Headlight reports that Carslbad Caverns NP and Carlsbad Caverns-Guadaloupe Moutains Association are offering a one-day course on cave photography on July 22nd. The one-day workshop will feature "discuss photographer safety, protection of cave resources, lighting, accessories, and basic techniques." Opportunities to practice these techniques will then occur along several parts of the Caverns. Registration in advance is required. At the recent Pro Photo Summit held in Redmond, Microsoft honored six photographers as Icons of Imaging, including three well-known Nikon shooters; John Shaw, Bambi Cantrell and Reed Hoffman. The summit is seen as part of the latest move by Microsoft to court digital photography users. Other moves reinforcing this strategy include the development of JPEG-rival Windows Media Photo format, and recent acquisition of the iView workflow application. Today's Nikonians discussion forums are being delivered to our members free of the usual graphic banners by Bibble Labs. Nikonians thanks Bibble Labs for their generosity. We encourage our visitors to check out their Nikonians Bibble Pro special offer for today. On the heels of the announcement that Pixmantec was gobbled up by Adobe, Eric Hyman at Bibble Labs offers a USD30 discount to RawShooter Premium owners to move to Bibble Pro 4.8. The limited time offer is only good through the month of July 2006. The 28-June edition of Newsline International reports that Fuji will discontinue some film stocks as of 1-July and raise prices across the board. Price hikes will be applied in the range of 3-10 percent to 35mm, 120 and 110 formats, affecting both color reversal and color print. With the introduction of the FujiChrome PROVIA 400, the TRE BI 400 is being discontinued. Also impacted are some multi-roll packs and long film versions of PROVIA 100F, VELVIA and VELVIA 100F, due supposedly to decreased demand. A Technical Note on Nikon USA's Digital Knowledgebase outlines some of the compatibility issues of running programs on the new platform such as Capture or NikonView that were originally written for the Motorola-based Macintoshes. Rob Galbraith offers some insights based on his own field tests. Of interest is the fact that Capture NX, ideally the focus of Nikon's efforts in order to meet a late-summer launch, is not planned to be a Universal Binary at this time. PDN Newsire reports that the cost of copyright registration with the US Copyright Office will increase starting 1 July. The cost of registering a single photo or groups of photos will go up from USD30 to USD45. In addition, hourly rates for records searches will go up from USD75 to USD150. An estimated search fee will cost USD100. In a very quiet acquisition, Adobe Systems has acquired Pixmantec, the makers of the popular and lightweight RAWShooter photo conversion software. Of immediate impact to digital shooters is the fact that RAWShooter will be discontinued. The free Essentials version will continue to be marketed and made available until Lightroom leaves beta state. RAWShooter users will then be offered an upgrade path to Adobe's products. Jessica is back and at her new Island Getaway! This week's tour through the Nikonians community highlights some activity in the "Photographers Wanted" and "Travel And Getting Together Forums." The Nikonians Resource Library is happy to announce the Nikon D200 Autofocus, Five Easy Tricks to Improve Your Photography; as well as a fantastic story about a Nikonians' trip to Greenland. Also included D2X and D2Hs firmware upgrades announced by Nikon. Finally, Jessica calls all Nikonians for a bit of feedback as to what areas of the community they'd like to hear about! Nikonian George Mann's series of 100 articles on Adobe Digital Photography Workflow are taking a timely detour to help understand all the new features and tools to be found in the recently released Adobe Lightroom Beta 3. The Lightroom Beta releases are currently available on the Mac platform, with Windows versions to follow. George Mann shifts to the Beta 3 topic in his 46th installment of the series. His articles include links for Mac users who wish to download Adobe Lightroom Beta 3 and follow along. Bibble Labs has today announced the release of version 4.8 of their RAW conversion software, Bibble Pro and Bibble Lite. Major additions inlude a new Lens Correction module and a B&W/Spot color module. Bibble 4.8 also adds support for the Fuji FinePix S3 DSLR and is now available as a "Universal Binary" for Intel Macintosh users. Today's discussion forums are being delivered to our members free of the usual graphic banners by Alien Skin Software's new Photoshop plug-in, Exposure. More Nikonians Needed for Photokina! Nikonians is still in need for volunteers for the upcoming photographic exhibitions of 2006; New York's Photo Expo Plus and Cologne's Photokina. We are in particular need of Photokina volunteers! If your reside near the area or plan to be visiting around 26-September through 1-October, consider stopping by and helping out at our booth. Volunteers working a half-day will receive a Nikonians cap and shirt as well as free passes to the show. Is this the ultimate digital SLR lens? Nikonian Victor Newman's (vfnewman)18-200mm f/3.5-5.6G ED IF AF-S VR DX Zoom Nikkor review is now available in our Resource Library. He was one of our first Nikonians to buy and review this lens and he explains why it has been hailed as much more than just an ideal lightweight travel option. If you have been wondering if one lens can give you the 35mm equivalent of 27-300mm with enough vibration reduction to handle low light shoots without a strobe, or even a tripod, Victor's review answers the question with example images taken under challenging conditions. Join Jason and Rick for more on their series on RAW conversion software as they review DXO Optics Pro. Rick and Jason also give their impressions of the Gary Fong Lightsphere, available at the Nikonians Pro Shop. Click here to download The Image Doctors #17 (NPC-ID-2006-06-22.mp3; 32:34, 15.3MB, mp3 format). Veteran member Allan Schroeder (rutherfordphoto) has started a visual diary of Claus Brandt's latest photo safari to Kruger NP and Tshukudu Lodge in South Africa. We only had a short time to arrive at our camp in Lower Sabie before the gates closed, but within 25 minutes of arrival in the park, we had encountered Lions, Elephants, Buffalo, Impala, Zebra, Giraffe, Baboons, and Wildebeest. Aperture 1.1.2 addresses issues related to overall reliability and performance. This update is recommended for all Aperture users. Panasonic/Matsushita's entry into the DSLR fray now has a date; the much-anticipated L1 will be released in Japan on July 22nd and in the US in September. The camera is based on Olympus' E330, but is paired with a new Leica Autofocus 14-50mm/f2.8-3.5 short zoom equipped with optical image stabilization. The arrival will heat up the competition in the desirable entry-level DSLR market currently dominated by Canon and Nikon. Several news channels including our colleagues at Letsgodigital are reporting on an emerging product from Georgia Tech College of Computing that can block unwanted video and still digital photography by being able to detect the presence of CCD sensors. 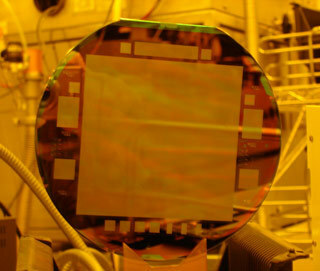 Dalsa Technologies has successfully created and delivered a 100 MP+ CCD imager to Semiconductor Technology Associates (STA) in San Juan Capistrano, California. STA is providing the chip to the US Naval Observatory to help in mapping out the location and movement of celestial objects. Readers who are thinking of the potential of a DSLR with such an imager will have to wait longer for more innovation: the chip is approximately four inches by four inches and would not fit in any traditional 35mm format body currently available. We are looking for a member who can help out managing the Nikonians Webring. It's a light workload, typically 2-3 hours per week. If you are interested in helping out administrating our popular webring, please let us know through the contact form. While it may have started out as a marketing gimmick to boost his business, Brian Powers' aerial photo-mapping project has turned to an entirely different direction. For five days, the owner of Hawaiian Images Photography and Video snapped away with his Nikon D100 while flying at 500 feet, mapping out the entire coastline of the Big Island. The aerial feat in of itself is already impressive, but the fact that no one has conducted such a survey in the first place is also astounding. The News Flash #8 podcast has been postponed, but we expect to be on schedule coming weekend. Summer is here and that means airshow season has started. Get up to speed on your airshow photo techniques with Nikonians' own Digital Darrell using the D2X. Be sure to visit our forums to discuss this and many other articles. Adobe has released a third beta of the Lightroom workflow program. This version features improved control over file export size and resolution, metadata selection with print output and RGB value readouts as well as support for over 120 RAW formats. Nikon has officially announced they intend to release firmware upgrades for both the D2X and D2Hs that will enable many of the features currently found in the D2Xs. The D200 will receive a small update in the form of Image Authentication and WT-3 compatibility. Nature photographers who have dreamed of shooting in Arctic conditions near massive icebergs will want to see the newest entry in our Personal Journeys section. We have just added the story of a trip to Greenland by Nikonians member Björn Olin (essingen). He tells of a memorable kayaking trip through icebergs in West Greenland, with great images from a light camera kit consisting of a Nikon D70 and two lenses in his Lowepro bag. Björn returned with a fascinating story about his travels, supported by breathtaking photographs. Alliacense today announced that Nikon Corporation has become the latest manufacturer to purchase a license to the Moore Microprocessor Patent (MMP) Portfolio, a group of patents that enable higher performance and lower cost designs in today's digital systems. Nikon joins a remarkable and diverse group of the world's most well-respected designers of digital systems including HP, Casio, Fujitsu and Sony. Terms of Nikon license purchase were not disclosed. Editor's Comments: This is an interesting move by Nikon, and will have a great impact on how the next series of DSLRs are engineered. As the industry starts facing shorter product lifecycles and more aggressive moves by new entrants to the market, only innovative and well publicized products can survive. The MMP Portfolio is well-known in technology circles and includes microprocessor technology patents which are functionally vital to complex electronic devices. This is a very aggressive move and we'll be watching to see the fruits of the purchase. Thanks to a recent thread in our D200 forum, we were led to a Microsoft Pro Photo article from late 2005 showcasing the usefulness of Global Positioning Systems (GPS) in photography. Thanks in part to a re-examination request by The Public Patent Foundation (PUBPAT), the US Patent Office recently rejected some of the broader claims by Forgent's claim on the JPEG format. As some of readers may recall, Forgent acquired rights to the ubiquitous file type through it's purchase of Compression Labs in 1997. In 2004, Forgent leveraged that claim by suing over 34 major manufacturers whose products depended or used JPEG files, including the likes of Apple, Xerox and IBM. If you are mystified by the large variety of autofocus options available with your Nikon D200, or have been searching for a simple set of composition basics, we have the answers in our Nikonians Resources Library provided by our own Digital Darrell and Tom Boné. After his successful article on the Multi Cam 2000 AF Module, found on the D2X, D2H, D2Hs and F6 cameras, Digital Darrell has done it again, providing us a new Nikon article with a simple but detailed explanation of how the Multi Cam 1000 AF Module on the Nikon D200 works, and how to make use of its custom settings for greater photos with his article: "Understanding Nikon D200 Multi Cam 1000 AF Module"
Tom Boné compresses decades of professional photography into five easy tricks, offering us an amenable illustrated Nikonians guide. His advice is simple: The key to success will be to use at least three of the tricks with every picture you take to make a giant leap forward in your photography skills. Join Bo for this Nikonians News Flash. Info on Gary Fong's Lightsphere II and the Katz Eye Optics Custom replacement screens. Some new items in the pro shop from Gary Fong and Katz Eye Optics. Gary Fong's Lightsphere II to soften up your light for portraits. It softly diffuses direct light with a large, soft source. No flare on the front of your lens. Especially recommended for macro work, precise final manual focusing, and DOF checking. User menu addition: Silver and higher receives rebate on certain products. Nikon's annual Photo Contest International for 2006-2007 is now accepting entries. Since 1969, the contest has attracted over 1.2M images from 290,000 photographers while communicating a rich and lavish visual culture. This year's theme is also Nikon's brand statement - "At The Heart of the Image." And Nikonians enjoys a historical link to this contest as well - one of 2004's 3rd Place winners was our very own Team member Ron Green (rbgreen2) with his entry "Pelican Trio at Bandon Marsh." In addition to the fame, there's plenty of fortune; winners in each category will receive Nikon digital SLRs or Coolpixes and accessories. The Nikonians Pro Shop announced today that it has added several new products to its catalog for demanding photographers. Gary Fong's Lightsphere II diffusion dome makes shooting portraits with a shoe-mounted flash incredibly easy-- even when your camera is vertical. Katz-Eye Optics split prism focusing screens give Nikon DSLR owners the opportunity to use the classic screen that so many manual-focus users love in their D2X, D200 and D2H cameras. Both the Lightsphere II ID and Katz-Eye Screens are available for immediate pre-order with the first shipments expected in two weeks. As always, proceeds from the Photo Pro Shop go to support the Nikonians Community. Why buy anywhere else? Nikonians is pleased to announce that the Discussion Forums are being sponsored today "banner-free" by CopperHill Sensor Cleaning tools. All Nikonians that click the link and order using Paypal are entitled to a 10% discount today only from CopperHill Images when you enter the special coupon code listed in the forums! Sponsored this week by Adobe Lightroom Beta! Try Adobe's Lightroom beta for free! In this week's episode, we offer user impressions of the D200, discuss the new D2Xs, and give a special preview of Nikon Capture NX, which we have been beta-testing since March. Rick is back from Australia with a report on his trip. Did his packing tips from Episode #15 pay off? Or did he forget to heed his own advice? We present out first-hand user report of the Nikon D200. Check out the Nikonians D200 review article for even more information. Rick and Jason have been "secretly" testing Nikon Capture NX since March. Hear their exclusive first-hand impressions about this powerful new software from Nikon! As always, don't forget to leave your comments or suggestions in the Podcast Feedback Forum. For our UK members, Photographyblog reports on the availability of Nikon Family and Travel kits that bundle a variety of accessories, including flashes, lenses, cleaning implements and a book voucher from Dorling Kindersley. Bogen Imaging US is offering rebates until the end of July 2006 on three of it's most popular Metz flashes for both digital and film cameras. Save USD76 on the Metz 76 MZ-5, USD50 on the Metz CL-4 Digital and USD40 on the Metz 54 MZ-4. Bob Atkins has tested the much awaited Tamron SP AF17-50mm f2.8 XR Di-II and appears to have found a keeper. If you're after high optical quality, a fast lens which can blur backgrounds and stop action but you don't want to spend more than about $500, the Tamron SP AF17-50mm F/2.8 XR Di-II LD Aspherical [IF] is a lens you could be very happy with. Nikon Corporation will generously donate 5M Yen cash to assist the victims of the May 27th earthquakes in Indonesia. In addition, Nikon Singapore Pte Ltd will make a USD10000 donation, and Nikon Corporation will match any funds donated by company employees. Good news for our U.S. members who prefer Ilford film - HARMAN Technology has struck a deal with imaging products distributor WYNIT of Syracuse, New York. Sigma launches their 8mm f3.5 EX DG Circular Fisheye this summer, with coating and lens power improvements to better support Digital SLR cameras. The lens will be available in Nikon, Canon, Sigma, Pentax and Sony Alpha mounts. Nikonians who are looking to get their hands on the new D2Xs camera might want to consider getting on a pre-order list now. Nikonians sponsors Berger Brothers and Roberts Distributors are offering pre-orders for the new flagship DSLR from Nikon. The D2Xs is supposed to be hitting dealers' shelves by the end of June. Learn more about this exciting camera in our D1/D2 users group discussion area. In a not so surprising move, yet bold, after Konica Minolta turned over his operations to Sony, news have reached us from our content partners LetsGoDigital of the soon to be released Sony 10.20 Mpixel Alpha 100 digital SLR camera. It surely is going to get exciting in the DSLR market. 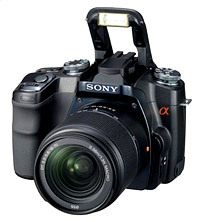 This Sony Alpha DSLR is expected to be on stores shelves this summer. Since July 2005, Sony Corporation (Sony) and Konica Minolta Photo Imaging, Inc. (Konica Minolta PI) have been working on the joint development of digital single lens reflex (SLR) cameras. Join Jessica for Nikonians News Flash. 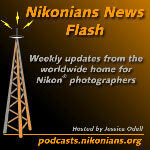 Contest winners, upcoming photo trade shows, and a preview of the new Nikon D2Xs DSLR. The winners of Segment 2 of the Photographers of the Year 2006 contest have been announced! First place awards went to Knut Askin of Norway in the Portrait category, Nico Housen of Belgium in the Wildlife category, and Albert Valentino of the USA. Winners will receive a copy of Bibble Pro Software from Bibble Labs. Volunteers are needed for two upcoming exhibitions! Photokina is in Cologne, Germany and runs from September 29 through October 1, 2006. The Photo Plus Expo in NYC runs from November 2-4, 2006. Volunteers are needed to help man the Nikonians booth, and will receive a day-pass to the expo, a Nikonians t-shirt and hat. Nikonians has teamed up with Letsgodigital to preview the new Nikon D2Xs flagship DSLR. Finally, Jessica explains the new phenomenon in the discussion forums, called "Banner Free Fridays"
Nikonians is proud to introduce "Banner-Free Fridays" in our Discussion Forums, starting June 2, 2006. Browse and discuss everything Nikon in our forums in a banner-free environment! Today's Banner Free Friday is brought to you courstesy of the Nikonians Photo Pro Shop (www.photoproshop.com). We certainly hope you enjoy this new program! In the wake of the D2Xs reveal, Nikon also announced the new stand-alone Camera Control Pro module and the Image Authentication software that verifies photo integrity for forensics purposes. Finally, there's more buzz on Capture NX including price and availability. LetsGoDigital-the premier online magazine for digital photography and Nikonians-worldwide home for Nikon owners, have published a first joint preview on the new Nikon D2Xs.